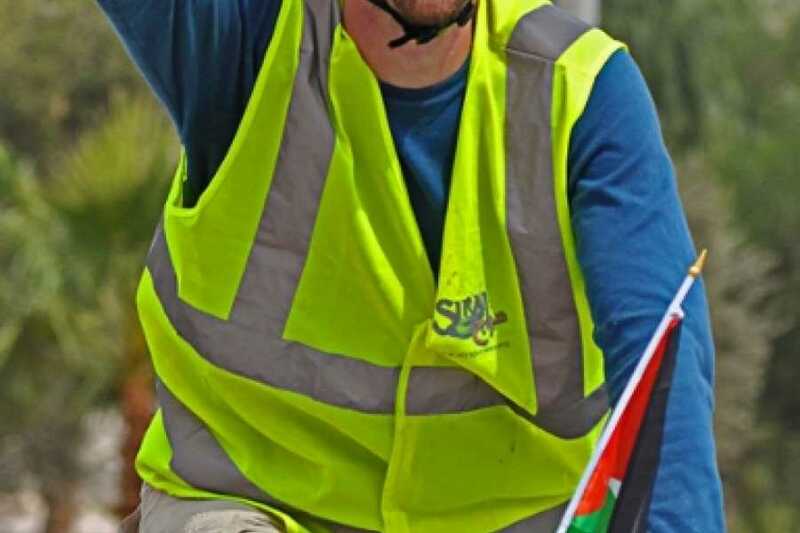 In the last decade, Palestine has taken off as a destination for cycling enthusiasts of all ages both as a place to enjoy the sport, and as a means to explore the cultural and religious diversity and unique beauties of the Holy Land. A support vehicle and local guide accompany the cyclists at all times. 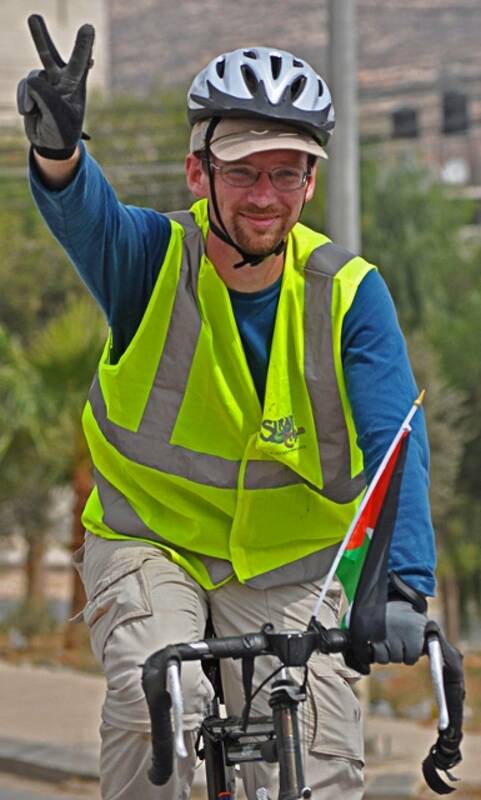 Palestinians are friendly people, and cyclists can be assured of a warm welcome, particularly in the more remote villages, countryside and Bedouin areas, where the fast pace of modern life has yet to spoil their authentic traditional hospitality. On the first day of the cycle tour, we will meet you at 12:00 noon at the Jerusalem Hotel located in Nablus Street, close to Jerusalem's Damascus Gate, opposite the Garden Tomb. From there a service bus will take you to the El Beit Guesthouse in Beit Sahour for a brief orientation. After that, our driver will transfer you to Jenin where you will get acquainted with our local guide, discuss any special needs, expectations and any other relevant information before the tour begins. Dinner and overnight in Hadad Resort. Cycle from Jenin towards Sabastya, the ancient Canaanite, Hellenistic and Roman city. Starting at Haddad Resort, cycle towards the village of Zebabdeh, towards the village of Missilieh. Continuing to the village of Sanour and its beautiful plains. Onwards towards the villages of Yassid and Beit Imrin by hilly roads. Arrive at the hilltop village of Sabastyah. Sabastya is believed to be the place where John the Baptist was beheaded. Lunch in Sabastya, then tour the ancient city and meet the local community. After lunch, cycle to Nablus, tour the old city and enjoy a Turkish bath - optional – at participant’s own expense. Dinner and overnight in the Al- Yasmin Hotel, in the old city of Nablus. 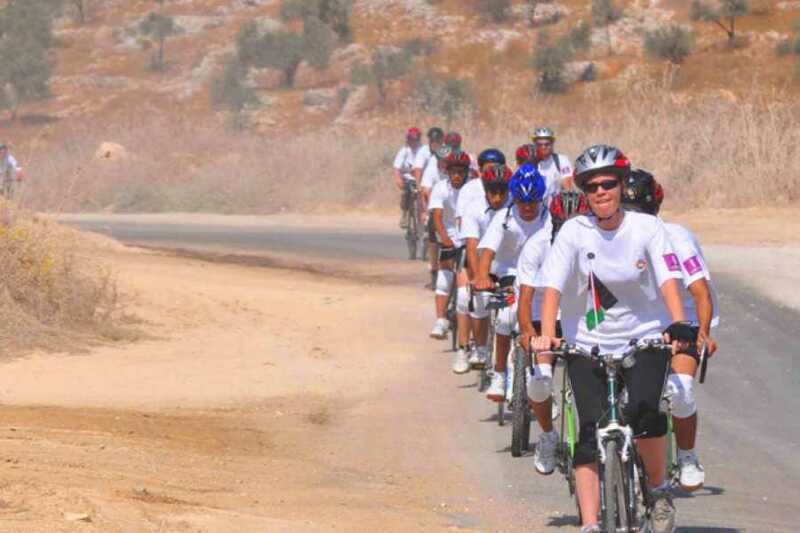 Start cycling in the old city of Nablus towards the south passing the villages of Huwarah and Beita. Continue towards the village of Aqraba – beautiful views of the Jordan Valley. Continue towards Majdal Bani Fadil, and rest in the village of Duma. Afterwards, cycle towards Mughayyar and Khirbet Abu Fallah villages. Next, push the bikes up the highest hill in the Ramallah area. With the support vehicle in attendance, we head towards the village of Kufur Malik, and then Dier Jarir. Arrive in Taybeh in the late afternoon. Tour the old village center and visit the ruins of the 4th century Byzantine church of St. George. Visit the Peace Lantern Factory, the Taybeh beer factory, and enjoy dinner with local families. Overnight in the Church Guest House in Taybeh. Cycle to Jericho. The easiest day in the entire tour, mostly down hill. Visit Hisham's Palace and the Mount of Temptation. Cycle through the Jerusalem Wilderness to the Dead Sea. Dinner and overnight in the Jericho Resort Village. Cycle part of the way to Bethlehem. Visit Nabi Musa, and then walk the dirt road to the Greek Orthodox Mar Saba Monastery. Enjoy the wilderness and experience the dramatic landscape. After visiting Mar Saba Monastery, cycle to Bethlehem. Dinner in Bethlehem, and overnight in the El Biet Guesthouse in Beit Sahour. Cycle around Bethlehem. Visit the Church of the Nativity and the Shepherd's Field. In the afternoon, cycle to Hebron and visit the old city. Transfer by mini-bus back to Bethlehem. Farewell dinner party in a local restaurant in the Bethlehem area. Overnight in El Beit Guesthouse, Beit Sahour.